So I wrote earlier this week about how I graduated with my MFA (confetti!) in Vermont. Those ten-day residencies in Vermont can get intense. We go for twelve+ hours a day, and it's nonstop. By the time I was ready to fly home (with a layover in LaGuardia, sob), I needed something really light and fun for my plane reading. Cue Simon vs. the Homo Sapiens Agenda! My friend Amy Rose read this one a little while ago and said she stayed up super late to finish it in one night. This is high praise from Amy Rose, and I added it to my list immediately. Since then, multiple people on the internet and at residency have proclaimed their love for this book to me, to the point where this book was actually starting to guilt trip me. A tiny part of me was afraid to read it, though--surely it can't be a great as everyone is making it out to be? Simon Spier knows he's gay, and he knows his family and friends will probably be okay with it, but he's in no hurry to make a grand coming-out proclamation and deal with the drama that comes with it. Besides, he's perfectly happy with the secret online flirtation he has going on with Blue, a boy who goes to his school. But when Simon's emails to Blue are discovered, Simon is blackmailed into helping classmate Martin get closer to his friend Abby...and suddenly things get very, very messy for Simon. Becky Albertalli completely nails Simon's voice in this book. It came through loud and clear in the first two sentences of this book, and it stayed wonderfully funny and consistent throughout the entire novel. I loved everything about Simon--his quick wit and good humor in the face of sucky situations, how assured he was at times, his love for his family and friends, his exhilaration at his relationship with Blue, and even his vulnerabilities. Albertalli also does a really great job at balancing a large cast of characters. Between Simon's family, his close group of friends, and his wider group of friends from theater, there are a lot of people in this novel. Part of the focus of the novel is about Simon learning to negotiate the expectations that the various people in his life have of him while still trying to form his own identity without outside pressure, and the conflicts that Simon faces are believable. The larger cast also helps create the mystery surrounding Blue's true identity--is he someone Simon knows, and just how close is he? These questions and the resulting tensions pull the reader through the novel quickly. I laughed so hard while reading it that I woke up the woman next to me, and when I finished it somewhere over Lake Ontario, I was a little depressed. 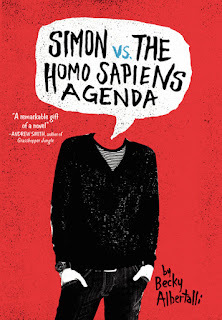 Simon vs the Homo Sapiens Agenda is a genuinely funny, sweet, and smart book, and it is a delight to read. I would read twelve more volumes of Simon Spier stories if they existed. So get writing, Albertalli. Book purchased from the incredible indie Bear Pond Books in Montpelier, VT!